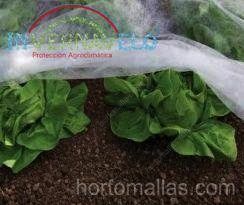 Frost blankets protect the crops from low temperatures. In this photo we can see one being used as a micro tunnel for a crop. This allows for the plants to ripen early. INVERNAVELO® frost blanket is a type of spun-bonded fabric which only weighs 17 grams per meter squared. It is resistant enough to withstand wind, rain and cold temperatures. At the same time the crop is protected underneath the anti-frost netting. 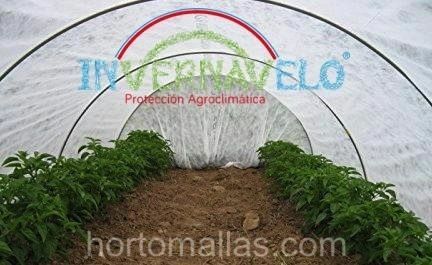 INVERNAVELO® is a barrier that protects the crops from the harsh weather conditions that can arise. 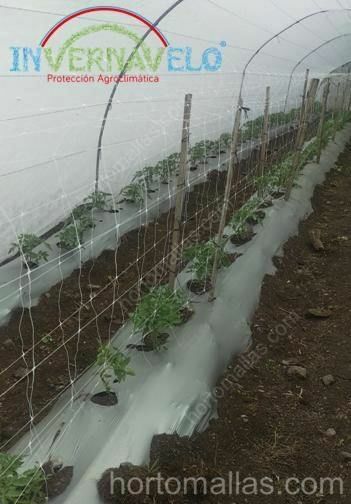 This agricultural frost covering protects the crops from low temperatures. Thanks to its polypropylene content it can be recycled without causing any harm to the environment. Many collection points and farm waste disposal sites accept them and some even pay by the kilo for it. Using a frost blanket can induce crops to grow. 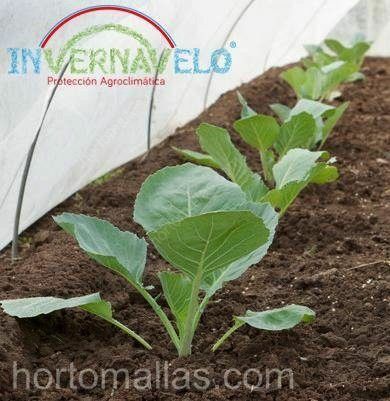 INVERNAVELO® is placed over the plants during their critical phases of development, generally when the plant has just started to grow, or has been recently planted out or sown. The initial harvest can be brought forward weeks before other farmers enter the market looking for buyers. Arriving at the market with the first crop of the season can mean achieving a price 4 times higher or more than when everyone has those fruits for sale. 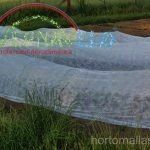 Using a frost blanket it is also possible to limit the access of insects that could have a detrimental effect on the crop. This product for inducing crops also serves as an anti-insect barrier. Although it allows air through, it blocks thrips and white flies, the main pathogen transmitters. The INVERNAVELO frost blanket also allows for rainwater to pass through it. It slows down the speed of the raindrops, sprinkles the water and prevents the plants from buckling over in a storm. Although it allows air and moisture flow, this thermal netting also acts as a windbreak barrier and reduces the devastating force of gales. 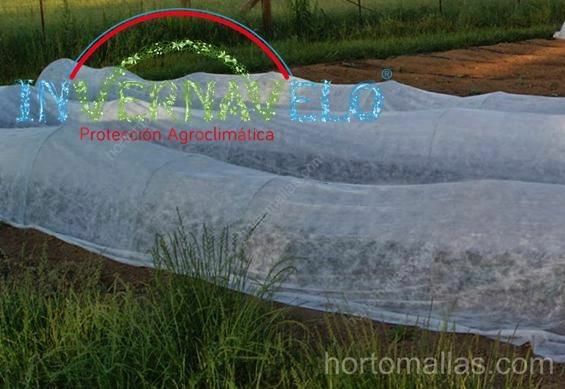 Thermal coverings for crops are often used in conjunction with horticultural trellis netting for crops such as tomatoes. The blanket or antifreeze material is positioned on top of the vertical tutoring structure and draped over either side of it until it reaches the ground. It can be held in place with a shovelful of earth around the edges. This prevents the wind from lifting it off and letting the crop get cold. It also avoids wasting the material covering posts and furrows. Another way of installing it is to use pegs or rods bent into U-shapes. These can be re-used and allow the cover to be removed when monitoring the crops. It is important to remember that crops that have had INVERNAVELO® positioned directly above the ground and where very little room remains for bumblebees, it is recommended that the covering be removed when the first blooms begin to appear so that pollination can take place. When the antifreeze material is installed in macro tunnels beneficial insect colonies can move around freely underneath the covering. This accelerates the pollination process as the biological agents find themselves confined to a greatly reduced space. The thermal anti-frost material or frost protection blanket comes in a standard size of 1.8m, 2.4m and 4m x 1500 meters in length. We also produce floating covers of wider dimensions upon request, up to 16 meters wide.